A quarter of a century and close to four hundred Grand Prix entered without a single win: this is the sad assessment that can sum up Arrows’ Formula One career. The team has often been closer to success than, let’s say, Osella has ever been, but for most of its existence remained a mid-grid outfit. At least it brought colours to the pack, from the elegant brown and cream, Barclay-sponsored cars of the mid-Eighties for which I have a special fondness, to the black and orange machines from their later years, or the early gold-painted Arrows of the wing-car era. The birth of Arrows was rather improvised. A group of dissident people at Shadow – former-pilots-turned-managers Jackie Oliver and Alan Rees, alongside engineers Tony Southgate and Dave Wass, and accompanied by budding star Riccardo Patrese – decided to quit the American team and join forces to create their own car with the support of a dubious Italian businessman (these last three words often seem to link together perfectly), Franco Ambrosio. Within months Ambrosio was in prison, leaving the coffers of the splinter group rather empty. In the meantime Arrows had encountered other problems – all this made for a rather inauspicious start. The very first Arrows, the FA/1 was a very conventional machine designed in less than two months… so conventional actually that Shadow successfully had the car banned from Formula One, seized and destroyed following a decision of the British justice, on the ground that it was nothing more than a copy of its own DN9. Anticipating this ban, Tony Southgate had already started to draw the blueprints of the disputed car’s makeshift replacement. This new A1 was created in only fifty-two days, in time to succeed the FA/1 without disrupting Arrows’ already chaotic season. 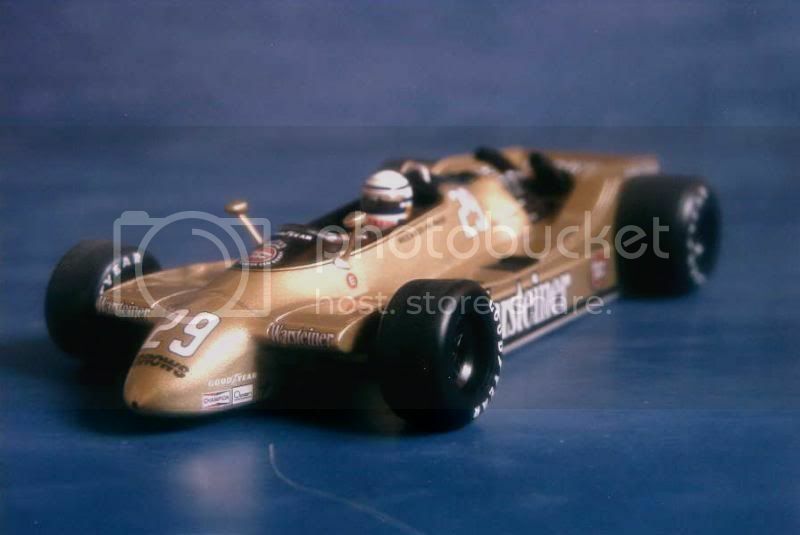 Furthermore the year ended with a drama, first pilot Patrese being involved in Ronny Peterson’s fatal crash in Italy and being banned for one race by his peers – some had suggested a harsher punishment. Having already used twice the word “ban” at this point of the story, the question that comes to mind is: was there really a place for Arrows in Formula One? Well, despite all this, the team’s first year in Formula One had been promising enough. Riccardo Patrese scored all eleven points the team collected, including a superb second place in Sweden. His team-mate Rolf Stommelen, who was attempting a comeback, was less successful and struggled all year long just to qualify. 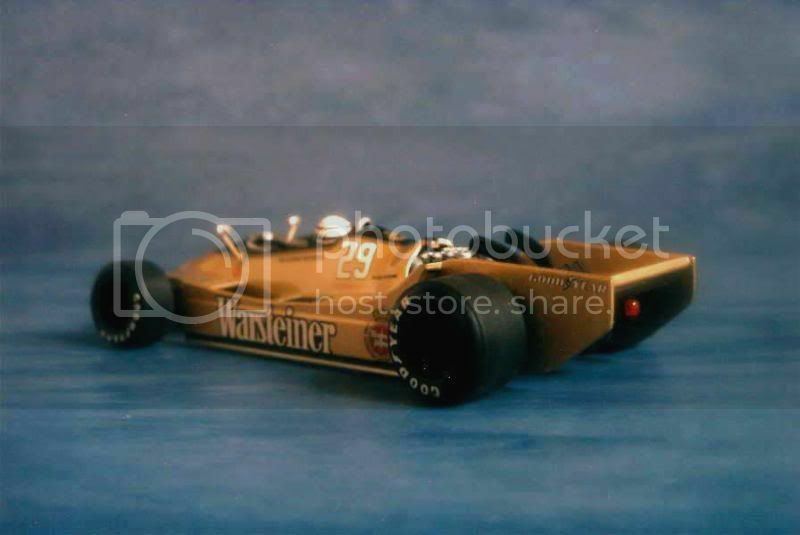 Comparatively, rival Shadow had only six points – after an extraordinary 1977 season, during which the team had won its first Formula One race, the break-up had marked the beginning of the end for the American outfit. Would Arrows progress even further in 1979 to become a front-line Formula One team? After starting the season with a simple evolution of its car, the A1B, Arrows revealed its new A2. Lotus had shown the way by dominating the 1978 championship with a ground-effect car; all teams followed suit and, in this respect, the A2 certainly was one of the most evolved “wing-cars” of its time. Unfortunately, this bold approach to advanced aerodynamics didn’t pay off. Riccardo Patrese and Jochen Mass weren’t able to score more than five points, announcing a twenty-five-year-long struggle to remain competitive. It is sometimes difficult to remain impartial. I like the car, its paintjob and the era it comes from, therefore it would have been hard to dislike the model. Minichamps did a wonderful job, providing this model with all the tiny details and parts we collectors like so much for they have the despicable habit of so easily breaking when handled clumsily. Though tiny in this scale, the visible Ford Cosworth engine is very nicely detailed. My rating is 15/20. A last minute addition: I just noticed on the close shot of the engine below the mention "PATENT PLENDING", which I never paid attention of until now. 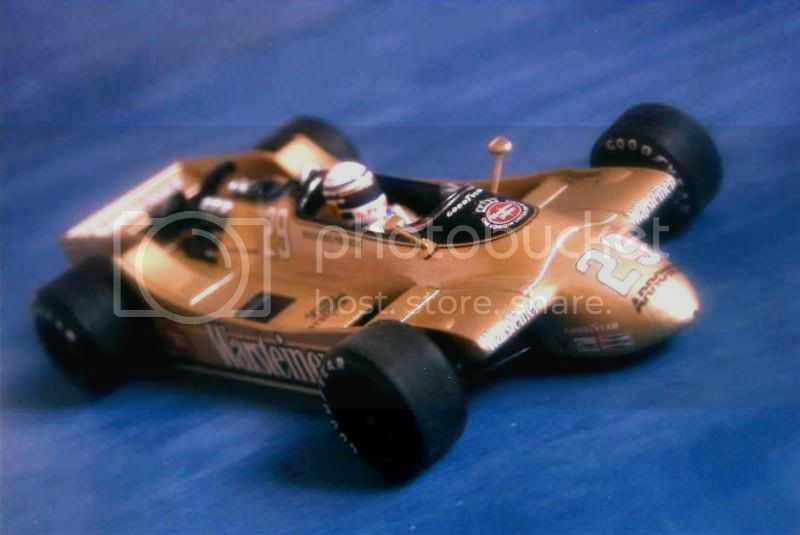 A Minichamps blunder or the faithful reproduction of a mistake on the original Arrows? Aaaah... 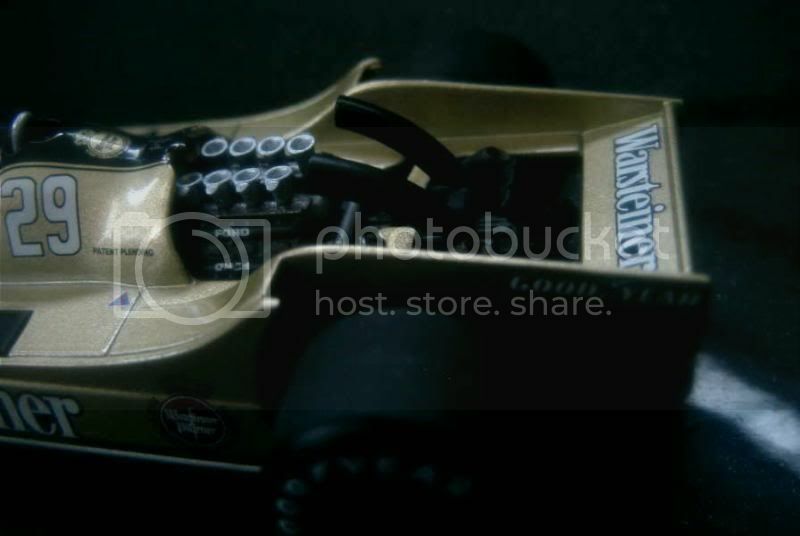 Formula 1, this is the greatest sport and the 70's and 80's are my favourit years. Nice, very nice Arrows, i've got one too but its the Jochen Mass Arrows. Excelent text! Thank you so much José António for your appreciation. Seventies and Eighties are also my favourite years for Formula One! Numerous entries, interesting tracks, and the small teams still had a chance to make an impression. Oh you have Mass' car? You're the lucky guy! Initially I had written in this post, then removed it before publishing, that I've never been so fond of Patrese and would have preferred Mass' Arrows! Precioso auto, uno de los F1 más bellos de la historia. 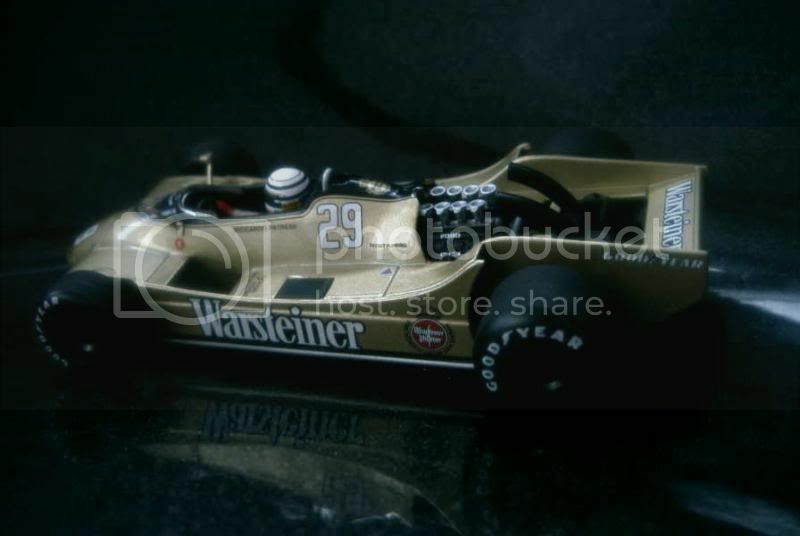 Por suerte tengo en mi colección el de Jochen Mass, también de Minichamps. 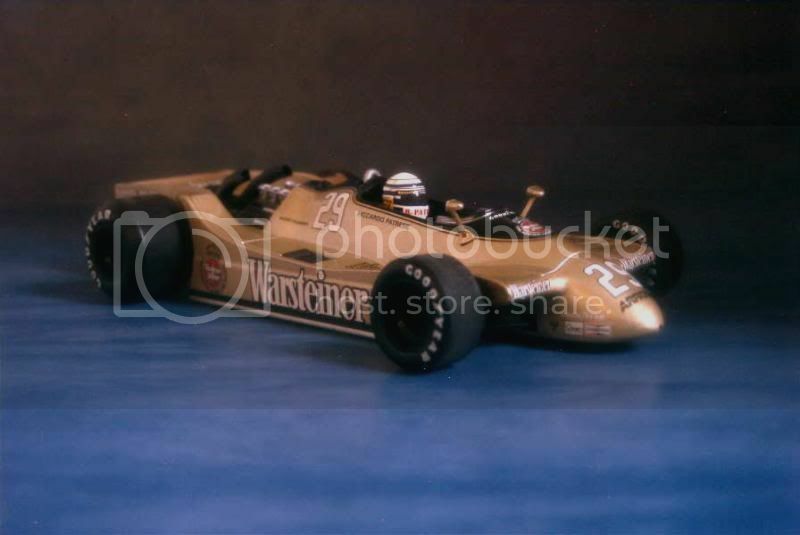 Lorenzo, however, I preferred Patrese's car. But I got just the Mass. Hahaha so we'll just have to swap our cars then!